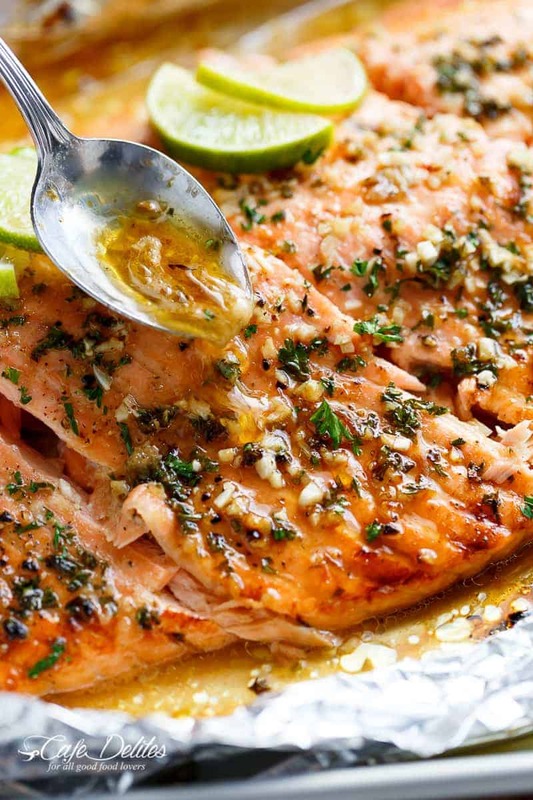 Honey Lime Garlic Butter Salmon is ready in under 30 MINUTES! Caramelized on the outside and falling apart tender on the inside…. your new favourite salmon recipe is here! Honey Garlic Butter Salmon is without a doubt one of our favourite salmon recipes, and one of the most popular and loved recipe on our site. Swapping out lemon juice in that recipe for lime juice in this Honey Lime Garlic Butter Salmon — absolutely delicious. Readers write in all the time asking about ingredient substitutions in just about every single recipe we post. After this Honey Garlic Butter Salmon blew up everywhere, I’ve received so many questions about substituting lemon juice out for lime juice that I had to try it out for myself. Not one to back down from testing out your favourite flavour combination, this one has been a long time coming! Whether you love lemon garlic or honey lemon, or all of those flavours combined on your seafood, I can guarantee you will love lime (Chili Lime Salmon anyone?). It’s slightly sweeter and less acidic than lemon, which requires more of it added to the fish compared to lemon juice (to balance out the sweetness of the honey), while also adding LESS honey to compliment that lime juice. Also, the addition of garlic butter cuts through and enhances the flavours in the entire fillet. You will love this one! 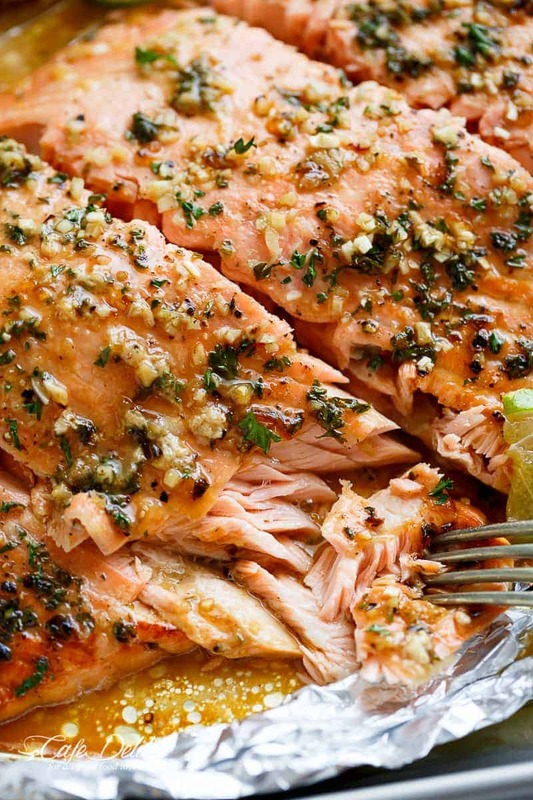 WATCH US MAKE Honey Lime Garlic Butter Salmon RIGHT HERE! Position a rack in the middle of the oven. Preheat oven to 375°F | 190°C. 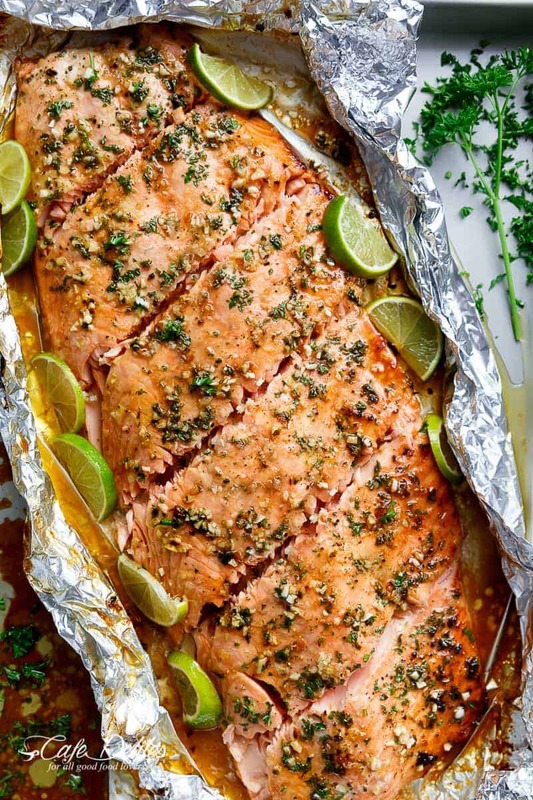 Line a baking sheet with a large piece of foil, or 2 long pieces of foil over lapping each other lengthways if your salmon is wide. In a small saucepan, melt the butter over low-medium heat. Add the honey, garlic and lime juice, and whisk until the honey has melted through the butter and the mixture is well combined. Place the salmon onto lined baking sheet. Evenly pour the honey-lime mixture over the salmon. Sprinkle with a good amount of salt (about 2 teaspoons), cracked pepper, and 2 tablespoons of parsley. Fold the sides of the foil up beside the salmon to keep the sauce under the fillet. Bake until cooked through (about 15-18 minutes, depending on the thickness of your fish and your preference of doneness). Then, change oven setting to broil (or grill) for 2-3 minutes on medium heat to caramelise the top. Garnish with remaining parsley and serve immediately with fresh lime slices. Made this tonight for Valentine’s Day with roasted fingerling potatoes and spinach souffle. It was easy and awesome. The only thing I did slightly different was to add a tsp grated lime peel. My husband and our 9 year old both loved it. Will definitely make again. Great recipe! ABSOLUTELY DELICIOUS!!! Of course I tweaked it a little to add my own touch, one being crushed croutons as a top crust (garlic butter flavor). I added a little salt to the crust mixture which accommodated the honey/lime. Very tasty!!! i love this & make it alllll the time. i am wondering though, how does it only have 11 cabs when 1tbs of honey has 17. not complaining, just confused & since i have gone back to low carb eating i’m trying to figure out how i can still eat this. I have made this recipe two weekends in a row. I cook it on the grill in a foil pack. My family loves it! Two thumbs up. Can i replace the Butter ? I would like to try this on the grill. Could you give me instructions. I’ve never cooked or ate salmon does the skin need to be removed prior to cooking? Most salmon will come with the skin already off. With this recipe the skin will be removed ahead of time. It won’t hurt you or the fish to have the skin still on, it may just take a bit longer after it is cooked to remove the skin. Hope that helps and you are able to try this!! It is one of my favorites!! just made this & the glaze just seemed to slide off not really cook into a glaze at all. it tasted really good. i think i’ll play around with glaze to thicken it so maybe it’ll stick to the salmon & stay on next time. This is my new fave salmon recipe – it’s soooo good!! I want to try this tonight but don’t have fresh parsley. Would you suggest using dry or something else? Thank you! I want to try this but am on a low carb diet. Is there a substitute for the honey that would still be sweet but low carb? Thanks for your response. Hi! This recipe sounds great, I’m cooking for family tonight and was looking for a salmon fish to serve up. 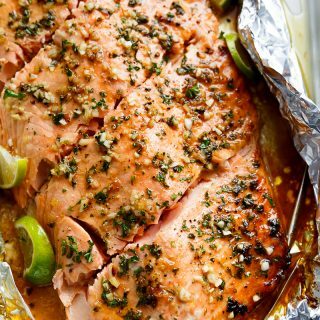 Just wondering, does the salmon need to he covered over the top with foil or left open? And I’m just cooking for 3 people so I figured I’d just need to half the recipe? Thanks! Hi Kerry! I didn’t completely cover this one as I prefer the slight charring from the honey, but you can close it if you wish! Both work deliciously! I think this recipe looks delish but I’m not a salmon fan. Could you suggest a flaky white fish to substitute? Made this for dinner last night and it was absolutely delicious. So easy to make and bursting with flavour, it went down a treat and very quickly. I made it with garlic parmesan rice and steamed kale and broccoli. Definitely will be a regular on the dinner table! Your recipes are second to none ? I’m so happy to hear that Emily! Thank you so much for coming back to leave a comment. Have a wonderful week! This Honey lime garlic butter Salmon is delicious! My family devoured it, I don’t think it lasted 10 minutes. Even the 9 year old grandchildren ate it and liked it. I served the salmon with the lemon butter garlic smashed potatoes, it was hands down without a doubt a delicious meal. Sonja that’s amazing! I’m so happy to hear that!!! I’ve done this before and it’s delish. One time instead of lemons or limes, I used oranges. Still turned out great! Sorry, Just posted a comment on two of your recipes and made the wrong comment on this one. This is an awesome recipe for salmon. It is such a refreshing taste and so much better than any of the lemon recipes I have tried. The lime is a great addition. I made this tonight and it was delicious. I had no balsmic vinegar so I made a red wine vinegar and brown sugar reduction and it worked just perfect. Hi Karina, I was so happy to see this recipe in my inbox this morning. My daughter tried the first one you reference to using lime, only in the same amounts as the lemon juice and it didn’t taste much like lime at all. Her name is Lisa. She also queried how to substitute it. I’m going to surprise her for her birthday dinner this weekend and make this one. Thank you for taking the time to test your recipes. I made this last night, and as with all your recipes, it came out fantastic. I love this site, your recipes never disappoint. I work for the Lawton Constitution newspaper in Lawton, Oklahoma and I would like to use some of your recipes in a column. I would, of course, give you credit for the recipe. Please let me know if I have your permission to use some of your recipes. They look scrumptious! Thank you for considering this request. Finally! I’ve been waiting for this one. You’re a gem! You have?! Aw I’m sorry it took me so long! Karina, I believe I did ask about using lime instead of lemon a while ago when I first saw it one Facebook. Really loved that one too though, and now excited to try this one. I don’t cook often so I’m scared to change ingredients too much without ruining the recipe. I love that you constantly go out of your way to help us out. We appreciate you in this household. I think my husband has a crush on you! Making your lime version tonight and couldn’t be more excited. I happen to have all the ingredients ready yay to me! Looking for something a bit different for dinner, found this amazing dish. Wow! So tasty even my salmon hating daughter loved it. Great recipe thanks. Hi Michaela! You’re welcome I’m glad to hear that! Karina we loved your original version, and now we love this one too. Thanks for this recipe. I’m so glad you did it as I often wondered if lime would suit the recipe with the lemon juice. We just nearly licked our plates clean! And thats saying something from two kids under 12 plus a very picky husband (or man child). You’re very welcome Leena! I’m so happy to hear that! Sounds like a great recipe. Salmon is very popular in our family. I will make this recipe for my girls this week, I am sure they will be pleasantly surprised. My daughter who is first year at uni gave me one of your recipes, which we recently both cooked and which was yummy. I since cooked another (cheesy meatballs) and tonight i am going to cook the one pan chicken potatoes and beans. Your recipes are great and easy to follow and quite healthy. I. Am on a calorie controlled diet and it would be great if you could detail the calories for each dish! Keep going as i think the recipes are fantastic.